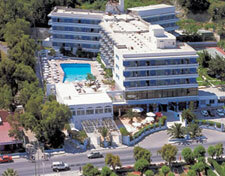 Belair Beach Hotel is a 4 * Star Hotel situated on the famous bay of Ixia/Ialyssos (West coast of the island) . The Hotel offers a Main building (4 floors) with 164 spacious and modern furni-shed rooms with a beautiful view to the sea, bath with hair-dryer, balcony, direct dial telephone, radio, satellite TV, Mini Fridge, safe(local charge) cots provided(free of charge) and aircondi-tioning. One of the most cosmopolite and modern beaches in Rhodes Island, Ixia offers you all the facilities you need for an enjoyable day working on your tan under the sun of Greece. Ixia beach lays only 5 km south of the romantic city of Rodos, on the northeastern coast of the Rhodes Island. You will simply feel complete on the beautiful 2 km long Ixia beach, surrounded by the amazingly clear blue waters, and guarded by green flabby hills. Many beach bars and tavernas tempts you with refreshing drink or a light Greek specialty. Lots of water sports options promises a bit of adrenaline .